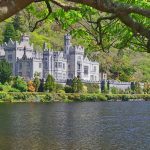 Traveling to Ireland for the first time? We understand the pressure when it comes to deciding on your Ireland packing list before a big trip- most especially if you’re coming from a country entirely opposite from your dream destination. Clothes play a big factor if you want to achieve that “Instagram-worthy” shot but it does not mean you have to sacrifice comfort over style. 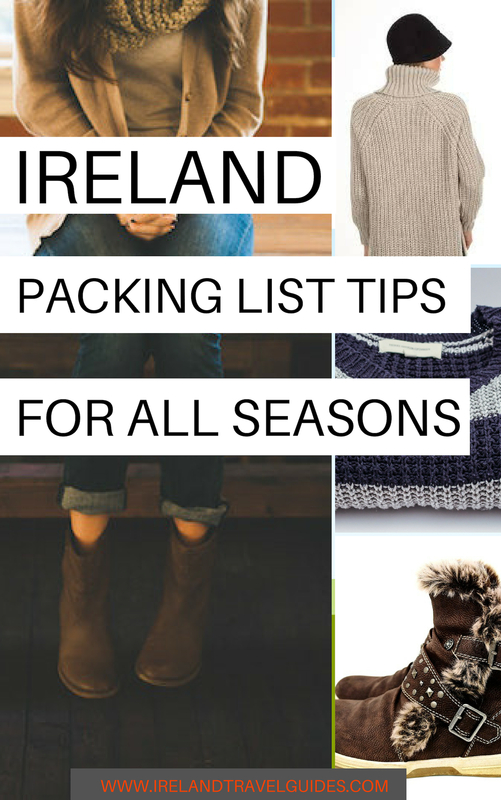 So to give you an idea what to include in your packing list (while keeping in-style and comfortable), here’s your guide on what to wear or pack for Ireland sorted by month. First things first, Irish always make sure they look presentable. They would prefer dressing up in trendy casual clothes while making sure it’s not too revealing because of the fact that revealing clothes are not appropriate for the cold Ireland weather. January is considered to be one of the coldest months in Ireland. This tail-end of winter is also expected to have more rain so be sure to pack rain-proof and cold-proof clothes along with you. Remember that when traveling, there is no such thing as bad weather… but only a poor choice of clothing. Raincoat – protect yourself from the unpredictable Ireland weather. A good packable raincoat like this Lightweight rain jacket from Amazon will always come in handy when traveling to Ireland in January since it only takes a small portion of your bag. Rain Boots – ordinary walking shoes will not save you from the wet season so be sure to prepare your rain boots. This Sperry Rain boot looks durable and chic– perfect for trendy female travelers out there. On the other hand, here’s another pair of rain boots for men. If you’re not planning to do extensive outdoor stuff, be sure to check them out. Hiking Boots – Planning to do more hiking in January? Be sure to pack a good pair of hiking boots to keep your feet warm and comfortable amidst the cold Ireland weather. This hiking boot from Timberland is a good option. Waterproof trousers – These waterproof trousers are good to layer on top of your thermal underwear. If you’re planning to pack lightly, check out these pair of trousers for men and women. Thermal socks – a good pair of thermal socks will also make you feel comfortable walking in the middle of the cold. Check out this unisex thermal socks from Amazon. February can either be cold or warm so the key to surviving the Irish weather during this month is to layer. You can easily remove one piece of clothing if the temperature starts to get warmer. But since February is around the corner, you might want to try these “date-worthy” pieces in case an unexpected trip to a fancy restaurant comes up. Winter scarf – scarfs are easy to layer when the temperature drops or you can tuck it away if the temperature intensifies. But this cashmere-feel winter scarf is a perfect addition to your February packing list if you want to show up a bit stylish on your date night. For girls, it looks great when combined with a black mini-dress and thermal leggings underneath. This elegant winter scarf for men is also perfect with a black turtleneck top. March, April, and May mark the spring season in Ireland which means you get to enjoy sun rays in the morning while wind and rain start coming in the afternoon. March also holds St. Patrick’s Day, the biggest and grandest festival in the country, so if you’re planning to enjoy the Irish weather during these times be sure to consider these options in your list. Jeans – You can bring a good pair of jeans. The temperature during the spring season is still cool so be sure your pair of jeans can protect you from the chilly air. Preferably, bring dark-colored jeans so you can mix and match any top with it. Anyhow, you can just bring your favorite jeans and flaunt them in the streets of Ireland. Pair of flats – You can now ditch your thick hiking boots or rain boots since spring in Ireland cannot possibly freeze you to death anymore. A pair of ballet flats for female or a topsider for male will already get you through this season. If you still want to prepare for the rainy nights, you can try these pair of waterproof ballet flats in Amazon and these Oxford-inspired shoes for men. Sneakers – If flats are too overdressed for you, you can also put on a pair of sneakers for a more casual look. This Black Converse Chuck Taylor is an all-time favorite because it is very versatile and can be paired up with almost anything. Windbreaker – Ireland in May tend to be chilly and windy on some days. So prepare a light jacket or a windbreaker in case you don’t want to get uncomfortable exploring Ireland. Umbrella – Don’t forget to include an umbrella in your packing list to shield you from the rain. This compact travel umbrella from Amazon is a good option as it will easily fit in your luggage or in your everyday bag. Fleece sweatshirt – Perfect for layering, a fleece sweater is also a good consideration. You can wear it on top of a jacket or just wear it as it is. This sweatshirt from Amazon should be added to your essentials. June marks the beginning of the Summer season in Ireland. It is expected to be warmer than the previous months but rain and wind are expected to be around the corner too. Be sure to come prepared by having these items in your packing list. Leggings – Finally, a month where you can wear a light piece of clothing. If you hate wearing jeans, a pair of leggings is a perfect addition to your list. Also, it won’t take too much space in your bag too! Be sure to consider these stretchy and opaque leggings in your next trip. Pencil Mini-Skirt – A pencil mini-skirt can be a very versatile piece of clothing and it is perfect for Ireland summer. If a slight chill makes you uncomfortable, you can pair it up with leggings. Otherwise, feel free to flaunt those gorgeous legs. This Bohemian floral skirt is a cute OOTD statement for the ‘gram. If you’re more into a bolder look, check out this zip-up pencil skirt in Amazon. Knee-length skirt – Here’s another option if you don’t want to wear leggings but also can’t stand the summer chill. A knee-length skirt like this one is a good find. You’ll be chic and fab once you pair it with a cute summer top. Jeans – If you just want to be plain casual, a pair of jeans is your best friend. Be more trendy with a pair of denim ripped jeans like this one. For men, this pair of distressed jeans is a good find. Plain shirt – One of the most basic items in your packing list is a plain shirt. The breathable fabric of a shirt makes it great for summer. Also, when it gets chilly, you can always grab a cardigan. This shirt from Amazon has a lot of color variety you can choose. Cardigan – Long or short, wearing a cardigan in summer makes you look fashionable yet comfortable. Flats – You can wear cute flats in summer if you don’t want your feet to be too exposed. 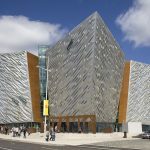 If you are planning to visit Ireland in June, check out our travel guide here. July tends to be a little bit warmer than June since it is the middle of Summer season in Ireland. With this, you can skip the layering and wear thinner clothes. Flannel shirt – a flannel shirt is not too thick and not too thin so you can make this as one of your items when traveling to Ireland in July. You can also mix and match this shirt with a lightweight spaghetti top underneath and wear it as a coverup for a more casual look like this one. 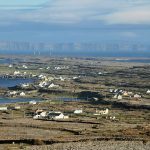 Sneakers – You can do a lot of walking activities in Ireland during the summer where the weather is nice compared to other months. So to be comfortable wherever you go, be sure to pack a pair of sneakers with you. Jeans – You can never go wrong with a nice pair of jeans like this high-rise skinny jeans which looks good with a flannel shirt. Sandals – You can wear an open-foot sandal or opt for a close-shoe. The temperature in August will begin to drop as Fall season approaches. This final leg of Ireland’s summer season is also not exempted from the unpredictable rain and wind. However, you might also want to align your packing list with the numerous summer festivals held during this month. Denim top – a cute denim top and a denim mini-skirt will look good in a festival. Accessorize it with a denim-colored handkerchief wrapped around your neck and you’re good to go. Check out this denim crop-top to give you a headstart. Crop top – If denim is too thick and too heavy for your liking, a cute crop top like this will be perfect for you. Long cardigan – A long cardigan seems to be very trendy every festival. It is also perfect for the Irish weather where it tends to get colder. You can pack this faux suede fringe cardigan or opt for this chic floral kimono. Denim jacket – A denim jacket will never go out of style. You can wear it as is or wrap it around your waist when it gets warmer. Amazon has this best selling denim jacket by Lee Indigo for women. Boots – Summer boots like this is also a great festival piece. You can achieve a bohemian or a chic look with it. Summer dress – Don’t miss a chance to wear your favorite summer dress in one of the most lively summer festivals in Ireland. This cute summer dress is great for partying all day long. Denim shorts – Combine your denim short with a cute top or a long cardigan. You can also tuck your denim jacket in it. September is the beginning of Fall season in Ireland and layering is yet again another trick you can master. In general, September is still a pleasant-month in Ireland with a mixture of sunshine and rain shower but it’s not that warm neither. Fleece sweater – When the temperature begins to drop again, a fleece sweater should always be in your list. Its material will keep you warm– sometimes enough to be worn alone or you can wear it underneath your preferred outerwear. Hoodie – You can also wear a hoodie on top of your innerwear. Hooded jackets can also shield you from light showers. Amazon is selling this pullover hoodie. Check it out here. Jeans – Pack lots (or enough pair) of jeans most especially if you are easily cold and since there will be chances of rain, you definitely don’t want to repeat wet jeans, right? Wool blazer – If you don’t want to be too casual, you can opt for a wool blazer like this one. You can go for a slim-fit type or the oversized type. What’s good about it is that you can easily layer it on top of your blouse or shirt while keeping a smart-casual look. Boots – In case of heavy or constant rainfall, pack sturdy boots to keep you comfortable walking around. This signature Timberland boot is a perfect addition to your Fall packing list. Umbrella – Stay protected from the rain by bringing an umbrella with you. The temperature will continue to drop from the middle of fall season until the end as it transitions to winter. During these times, you can expect more rainfall starting mid-October and a much cooler Ireland air. Be sure to consider these items if you’re not sure what to pack for Ireland in October and November. Wool skirt – a wool skirt is great for those who don’t want to ditch those chic clothing pieces. You can also wear leggings underneath it. Check out this classic A-line wool skirt in Amazon. Leggings – fleece-lined leggings will also save you from the dropping temperature. When buying one, be sure to choose a high-quality and opaque fabric like this listing in Amazon. If you are planning to visit Ireland in November, check out our travel guide here. December is undeniably a cold month in Ireland plus you’ll be battling with rain shower and wind too. Be prepared by packing thermal and thick fabric clothes for layering. Fleece inner wear– this will serve as your base clothing for layering. If you don’t have a fleece innerwear, a hoodie will do the trick. Winter coat – Do not forget your winter coat in your “winter” packing list, okay? This winter coat is a great addition to your list. Chapstick – Also one of the most essential items for winter. The cold temperature will eventually make your lips crack so to prepare for this unpleasant feeling, pack with you a piece of chapstick. Flannel – A flannel like this will work wonders if you want extra warmth. You can use it to layer underneath your coat and voila! Winter boots – Make sure you do not leave your winter boots behind. Make sure that it is durable for the cold and rainy season. If you are planning to visit Ireland in December, check out our travel guide here. 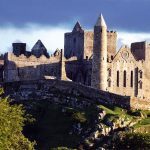 Ireland Travel Guides contains affiliate links all throughout the site. If you choose to purchase a product or book services through our affiliate links, this earns us a commission at no extra cost to you. For our complete disclose, click here.